Backpacking will not be an official part of our trips to the Grand Tetons, but you could get a permit for a backpack adventure if you plan ahead and bring appropriate gear. A few details about permits, etc. for Grand Teton national park adventures are at Grand Tetons backpacking. Experienced backpackers might pick up a few things from this page, but it is mostly for first time backpackers or those who may have gone before, but didn’t have a great time. Start by reading a good backpacking book. Most are a little out of date as soon as they are printed, because the rules for keeping food from bears change, or because new products come on the market, but they can still give you a start of an idea of what backpacking is about. “Backpacking Basics” by Thomas Winnett, fourth edition or later; ” Hiking and Backpacking, a complete guide” by Karen Berger (a trailside series guide); or “A hikers companion” by Cindy Ross & Todd Gladfelter are all good. Or check out all three from the library and compare advice. They and others can be found in the 796.51 section of public libraries. Look at the Wilderness First Aid outline at this website for a long list books. First-timer’s instructions has instructions for beginning snow campers for the De Anza College Outdoor Club winter trip. Experienced people will probably pick up a few useful ideas. You don’t need to rush out and buy a bunch of expensive new clothes and gear. Check Snow or rain camp must-haves for budget minded ideas. Let us look at what you have at a pre-trip meeting, it might be good enough. When you backpack you carry everything you need to survive (shelter, food, water, map, sunscreen, clothes for bad weather, etc.) and most people bring a few things for fun (camera, a star chart, a paperback book, a tiny deck of cards). Each experienced backpacker will probably have strong opinions about what they like to eat and what luxuries they are willing to carry. Willing to carry is the key. You should do regular extra exercise before the trip to get in shape. Walking up and down stairs for 15 minutes per day, wearing your hiking boots and a pack, is a good addition to your regular running or walking. Load the pack with at first one, then eventually six or twelve or . . . , one-liter bottles of water. Even if you are in good shape, your pack will feel heavy. Each step you take will be harder than normal. So people quickly decide they don’t need some things. You can eat almost anything with only a spoon, so many don’t bring a fork, and some buy a Lexan spoon. A cloth bag of spare clothes works as a pillow. You really don’t need a whole chess set to have fun, or you can buy or invent a lightweight model. 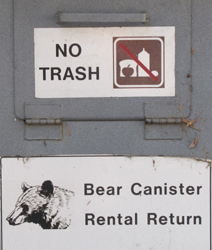 including info about what to do if you see a bear, how bears get into cars in Yosemite, how to store food during a climb in Yosemite and about the Backpackers’ Cache bear resistant food container. For our trips, the club owns enough canisters for a small group, or for each in a large group to prepack their food/toiletries in advance to get an idea of whether they need to rent more. Using a bear resistant food storage container has advice on how to pack on more efficiently. Insulation for the outside of a Garcia Canister or other bear resistant food storage only makes it easier for the bear to pick up the canister in it’s teeth, or with paws, and take it away. From the National Center for Biotechnology Information, U.S. National Library of Medicine “Diarrhea is the most common illness limiting long-distance hikers. Hikers should purify water routinely, avoiding using untreated surface water. The risk of gastrointestinal illness can also be reduced by maintaining personal hygiene practices and cleaning cookware.” Preferably use a water purifying pump, since iodine tablets are not effective against Cryptosporidium and some people are allergic to iodine. Lots of details about choosing these are at must haves for recreating in interesting weather. flashlight (electric torch) with spare bulb and at least alkaline batteries (not rechargeable, they don’t last long enough). Lithium batteries are expensive but way lighter. Unscrew a screw-on type or rubber band the switch so it can’t accidentally go on in your pack. No, your cell phone flashlight function will NOT last long enough or be bright enough. insect repellent (read some advice at: insect repellant, including a possible answer to the question: Are bears attracted to citronella? water bottle (2, 3?) with tight lid that has never had anything but water in it. If you mixed lemonade in it, it has a scent and you can’t have it in your tent overnight. If you choose to use a bladder with the long plastic straw, are you sure it won’t leak and soak your sleeping bag? one shirt to hike in and one to wear to bed (don’t bring too many extra changes of clothes; just let your one pair of hiking shorts get dirty. But do bring changes of socks, and underwear. No cotton socks and some people say no cotton at all, but many wear cotton t-shirts and shorts. Leave no trace When going into the wilderness, choose hiking, backpacking, and camping gear and clothing that are natural earth tone colors like green, brown, tan. (Some websites also recommend black, but it, along with flowery prints and bright colored clothing, attract insects that sting.) Bright colors like white, purple, blue, red and yellow do not blend in with the environment, can be seen from miles away and contribute to a crowded feeling. But do carry at least one item of very visible clothing and/or gear to help rescuers find you if needed. personal I.D.s such as driver’s license, medical insurance card, credit card, power of attorney for health care card, auto assn card, dimes for phone calls, traveler’s checks, spare car keys. You can put the I.D s in a baggie and then into a fanny pack that holds your most irreplaceable stuff (including your epi-pen or other medications). In one pocket of the fanny pack put the quarter you use to open the bear-resistant food canister, and always make sure it goes back into the pocket immediately after use and doesn’t get left sitting someplace. litter bag (double plastic bag that’s big enough to hold your own trash, toilet paper, and stuff you notice someone else left on the trail). 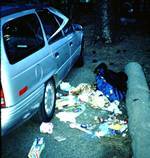 Don’t bury any trash, or dump anything in the backcountry outhouses, even orange peels. Don’t try to burn tin foil, it just turns into ugly specks in the firepit. Don’t try to burn tea bags, excess food, coffee grounds, etc. Burning organic matter completely requires a very hot fire, hotter than most campfires. duct tape wrapped around one person’s water bottle to repair various things or act as emergency moleskin. Don’t leave the duct tape on for long after the emergency repair to bake into place permanently. some sort of videorecorder, extra batteries, extra memory chips, etc. so you can look on the LCD screen in the morning at the tape of bears trying to raid food the night before. Some people like the safety of a cell phone, others think it wrecks the ‘wilderness experience’. The biggest problem is people who bring one instead of the essential gear/knowledge/and good judgement and expect to be bailed out, or who take risks they wouldn’t without the backup of a phone. Until they get a better system in place, when you call 911 from a cell phone you will get dispatch for the Highway Patrol in a far-off city instead of the park rangers or forest service where you are traveling. The Highway Patrol dispatch may have no idea how to quickly contact the people you need. If you intend to use that cell phone, find out what the eight digit direct dial phone number is for the help you could need. blue jeans (they’re too heavy, dry too slowly). Try lighter pants/fleece pants or maybe just shorts and longjohns and rain pants. If it’s too cold at night for only those on a summer trip, it’s time to go to bed. Get in your sleeping bag. canned bacon–too much grease to pack out, too much mess to cook, splatters all over and attracts animals later —Instead try some Boar’s Head brand pre-cooked bacon in small plastic packages that do not require refrigeration. frisbee — How are you going to chase one around without trampling plants? cost of Staying Found, by June Fleming or Be an Expert with Map and Compass, by Bjorn Kjellstrom: free at the library. instead of heavy running shoes for your second pair, you might want to try cheap, light aqua socks (but check the weight, some are as heavy as shoes). If you choose open-toed sandals, you might want to wear thick socks with them; the last thing you need is scuffed toes. If you tie them outside of your pack while they dry after crossing streams tie them on securely. A pack, tent, or sleeping bag–you can rent them. Boots, so you can wear them around and break them in. Buy boots late in the day, after your feet have swollen some. Have the salesperson measure your feet–don’t rely on your street shoe size. Bring the two pairs (one light, one heavy) of socks you’ll wear with the boots and any orthotic devices you’ll use. To carry a pack most people need boots that go up over their ankle. The cool- looking pair might not be the best fit. Spend some money on these, you’ll use them for a long time. Many places will let you return pairs you only wore inside if it turns out they are the wrong size. Extra clothes, maybe including good clothes to go to a nice restaurant after the trip. More recreational items like books to read, art supplies. A small raft, paddles and life jackets for floating down the Merced river would save you the fee to rent one. Bath towels. Leave the ice chest for snacks on the drive up in the bearproof footlocker sized storage at the backpacker’s or trailhead parking lot. An ice chest brought empty could be filled after the backpack with goodies for any camping you do after our trip, just be sure you leave it, and any toiletry items or snacks for after the trip in one of the bear-proof boxes at backpacker’s parking (or some trailheads) while we are backpacking, not in your car. Bears also try to break in when they see things that look like food containers, so no bags, boxes or bottles should show through the windows. For that matter, try to leave your car looking empty so humans don’t break into it. For a short backpack trip, you can get by without buying expensive freeze dried food, or even without cooking. But most people like some hot food and something resembling a main dish for dinner. Consider this if you want to go to the top of a peak. You might not want to bring a stove at all. If you spill some boiling water on your hand, for example, you won’t have enough cold water to pour over the burn to stop the burning and ease the pain. You can get by just fine (or even be somewhat gourmet) with cold food. You really can have a filling, tasty, healthy meal from just trail snacks and water. Go to GORP and hiking snacks for a long list of ideas. Instant hot chocolate (you’ll want something warm and liquid most early mornings or drizzly evenings), tea (or hot tea and Tang) and instant (thick or thin) soups can round out a low- or no-cook menu. Instant soups might normally be too salty for you but you might like them when you crave saltier things. Some people also crave spicier food–so the Nile Spice black bean soup might be perfect. When you have been sweating a lot you need to replace you salt so you will be able to sweat to cool off!! If you want main dishes, don’t spend $8-$15+ on tiny portions of expensive freeze-dried food. Try instead fairly quick-cooking boxed or packaged noodle or rice mixes, like Lipton Spanish rice, noodles romanoff with extra cheese, Betty Crocker hash browns, grocer’s house brand entrees/thick soups in cups. If you boil pasta you will need to strain the cooking water (and pack out the food bits) before you dispose of it far away from the campsite. Don’t forget your favorite flavor of instant packaged gravy and instant mashed potatos. margarine (you’ll want the calories). them into baggies, and pack instructions for rehydrating. Just think in advance–is it fairly simple, can I just add hot water and simmer it, or is there a chance it’ll stick to the pan and require a messy cleanup? Flour tortillas can be filled with re-hydrated beans / grated cheddar / hot sauces. Fully cooked, no refrigeration required, smoked Boar’s Head bacon for a high fat fix, but maybe not until you have been on the trail for a couple of days and are acclimated to altitude. (See at altitude for more on traveling at a high altitude). them and add a can of tuna in oil and the right amount of white or red wine vinegar and powdered salad dressing mix and you have a salad craving fix. But what if this doesn’t add up to a completely ‘balanced’ diet? On a short trip it really isn’t anything to worry about. Add some vitamin tablets for security if you want. Yes, most people bring too much food, but that’s okay. You need a variety. Sometimes you find that most of what you brought just doesn’t look appetizing, or you are just so tired and you can only fathom eating water and cashews for dinner. In which case you need lots of cashews. So it doesn’t matter if you have leftovers of other things. Repack foods to cut down on weight. Leave instant soup and others in their envelopes but don’t bring the boxes; just write out the instructions or cut them out and tape them to the baggie. Pre-measure instant potatoes into serving-size baggies and put instructions with them. Double bag at least the powdered items, if not everything, in good-quality plastic bags, not the giveaway ones from your grocer’s produce section. (8 tablespoons) as ingredients in various main dishes and only one stick for ‘extra’ so it’s important that other cooks know how much to not use on popcorn. At night- no midnight snacks in your tent, or even toothpaste that smells like food to bears. International travelers… it is not uncommon for customs agents to confiscate food you bring, so allow time and money to replace and repackage it. Again, go to GORP and hiking snacks for a long list of ideas. Horses and pack trains have the right-of-way. Yield to them by stepping off the trail on the uphill side and stand still and quiet until they are well past you. We can expect thundershowers, possibly with heavy rain, possibly with hail, every few days in the afternoon, so bring decent rain gear (you’ll be happier and dryer with a rain jacket and pants instead of a rain ‘poncho’) and a tent with a full rain fly. Hikes to peaks need to start early, so you can get to the top and get back down before the afternoon clouds build up. Don’t miss the pre-trip meeting for the De Anza College Outdoor Club backpack or camping trip for this season. This advice is not complete without the pre-trip meeting. Leave your make, model and license# of your vehicle along with your itinerary (marked on a map) with more than one responsible person along with who to call (Rangers? Forest Service? Sheriff?) and the number to call if you don’t check in by a given time. THEN check in with the responsible person when your return! To reduce over crowding, Yosemite uses a trailhead quota system which limits the number of people who may begin overnight hikes from each trailhead, each day. Some permits are available by reservation, some on a first-come first-served basis the day of, or one day prior to, the beginning of your trip. Ways to get a permit are at: http://www.nps.gov/yose/planyourvisit/wildpermits.htm That page also has links to agencies outside the park that issue permits for trailheads you might start at outside the park, but then hike into the park. At that page, at least during the busier times of the year, you can often find a link to a page which lists trailheads and the days they are already booked. 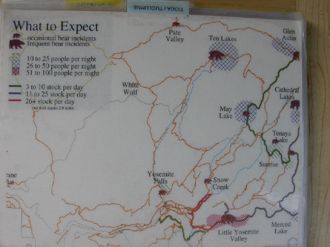 The text says “NO reservations available on the following dates for the following trailheads as of (date).” If the date or trailhead isn’t listed, space is available. The most popular and first Yosemite trailheads to fill are usually: Happy Isles → Little Yosemite Valley, Happy Isles → Sunrise/Merced Lake (pass through), Glacier Point → Little Yosemite Valley, Sunrise Lakes and Cathedral Lakes. At the Yosemite wilderness centers there are often binders with ratings of trails by number of stock per day, camping areas by number of campers per night and bear incidents at camping areas by occasional or frequent. Does it seem like tooooo much trouble to get a permit? Backcountry rangers patrol and check out campers. Out-of-bounds campers (camping where it is not allowed) or those without permits have to walk back out. There are lots of 24-hours-a-day places to return rented canisters. The park recommends you leave around sunrise or earlier and have a pre-agreed, non-negotiable turnaround time, such as if we are not at the top by 3:30 p.m. we will turn around. (Remember that it can take a minimum ONE hour to get from the base of the subdome to the top.) Bring at least one gallon of water per person. When the cables (photos below) go up early in spring, the trail will be wet and icy in places and people are encouraged to be prepared for winter hiking conditions. Sometimes the cables do not go up as early as expected, due to snow. People who get May permits should verify that the cables are up before they do the long hike and find out the cables are not up. If there is a fire in the vicinity the cables can be closed. 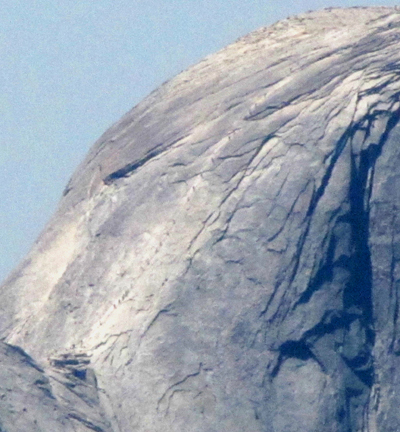 There is a preseason lottery for permits to climb the cables to go to the top of Half Dome . Why the permits? In summer of 2009 on Saturdays and holidays Half Dome hikers averaged 840 per day (estimated at a peak of 1100 to 1200) and people have had to wait up to an hour to go up. Now a maximum 300 hikers are allowed (about 225 day hikers and 75 backpackers) each day. Permits are required every day of the week, with each person needing their own individual permit. Up to six persons permits can be obtained under one reservation. There is a non-refundable application fee and a service charge for each permit. Reservations can be made through www.recreation.gov or by calling 1-877-444-6777. 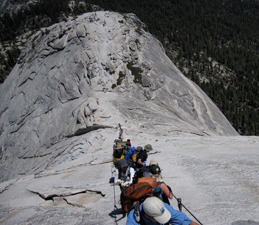 Backpackers in the area can get a Half Dome hike permit with their backpack permit. Approximately 50 permits will be available each day by lottery during the hiking season. “The Half Dome Cables in Yosemite National Park will be in place for visitor use this Friday, May 11, 2018. The trail will be wet and icy in places and visitors planning to ascend Half Dome are encouraged to be prepared for wet and cool hiking conditions. 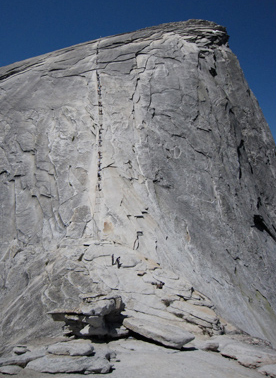 There is a daily lottery for a limited number of permits which are required to ascend the Half Dome Cables. This lottery opens Wednesday, May 9, 2018 for the summer season. These permits are available online through the daily lottery operated by www.recreation.gov. To apply for a daily lottery permit, applications are accepted from 12:01 am to 1:00 pm two days in advance of the intended hiking date. Lottery applicants may request up to six permits. Day use permits are required to ascend the Half Dome cables 24 hours a day, 7 days a week. A $10 application fee will be charged for each application, and a $10 permit fee will be charged for each permit issued. Day use permits cannot be obtained in person through any office in Yosemite National Park. Permit applicants must use their legal name when applying for a permit and a matching government-issued ID is required at the permit check point. Overnight use permits are available through the Yosemite National Park Wilderness Center. For more information, visit http://www.nps.gov/yose/planyourvisit/wildpermits.htm. As of 2016, wilderness permits issued outside the park are no longer valid for hiking to the top of Half Dome. You can face misdemeanor charges if you go up without a permit – up to a $5,000 fine and/or six months in jail. The Half Dome cables were put up on May 11, 2018, June 2, 2017, May 27, 2016; May 2, 2015; May 23, 2014; May 24 2013; May 25 2012; June 22, 2011 and June 16, 2010 (twice as much snowpack in 2011/2010 as in 2012, 2013 and 2014). They were taken down Oct. 14, 2014/2013; Oct. 9, 2012; Oct. 10, 2011 and Oct. 11, 2010. 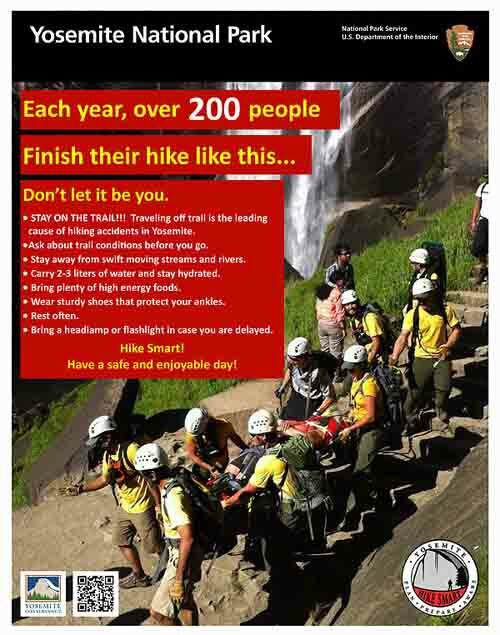 Don’t go up in the rain, most deaths on Half Dome have occurred when people try to descend in wet weather. On your way down the Half Dome cables, you can’t see the bottom from the top, and some of the rock face is slick from glacial polish. People sometimes put themselves and others in danger running down or even climbing outside the cables and running down, making others even more nervous. If you want to be extra safe, instead of clinging to the cables, you can sit and slide down slick sections on your rear. Doing this could also empower others who are nervous by allowing them to do it without feeling embarrassed. How much water will there be in the Yosemite waterfalls? has the answer. Yosemite National Park regulations, policies and rules links is an index to park websites on most subjects that have regulations affecting people’s use of the park. Many of the park websites have the reasons behind the rules. Last year, 166 search and rescue incidents occurred in the park, and may of these could have been avoided if the users had taken some extra precautions. · Tell someone where you are going: If you do get hurt or lost, someone will know where you went and when. Rangers then know where to start searching if you are overdue. · Bring extra water: You will better enjoy your hike be and avoid injury or sickness well hydrated. Remember that all water in the backcountry needs to be treated for bacteria like giardia lamblia. 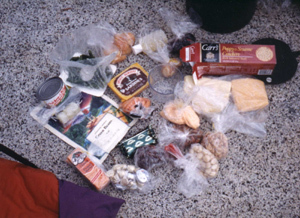 · Bring extra food: Your hike may take longer than expected and you may need it if you do get hurt or lost. · Bring rain gear: Weather changes quickly in the park and hypothermia may set in. · Bring a flashlight in case your hike takes longer than expected. · Bring a map and compass and know how to use them. · Bring a whistle: It can alert fellow hikers that you are in need of help. Rivers and creeks are dangerous in spring. Take care when fording and avoid swift water. Do not wade above waterfalls. The snow level on the trails is around 7000 feet. Trails can be easily lost in snowy conditions. Avoid cliff edges and do not scramble or climb rocks unless you are skilled and have the right equipment. Ask yourself if you are in the physical shape to do a strenuous hike. There are plenty of hikes for all skills and physical levels. Select the right one for you. Go ahead and grab the boots. Yosemite’s trails and backcountry are truly spectacular and rewarding. Taking extra precautions will make the experience more enjoyable. Getting rescued may be memorable, but it certainly ruins the experience. To truly be able to Leave no trace and follow backcountry rules about camping the proper distance from a lake or digging your personal latrine hole the proper distance from water, etc., you will need to know how far 100 feet is. Lay out a tape measure at home and walk it and count your paces.